You may be able to imagine how completely full of yay I was when I found more glowing stuff! Yes! Not only do I get my pair of blue glow-in-the-dark glitter plugs at long last, but there's also a good amount to share as well. You can now find the lovely blue glow-in-the-dark glitter plugs here (ready now, sizes 6mm - 20mm) but there's also a custom plug listing here, where you can pick which colour plugs you'd like, as well as the usual size and flare options. 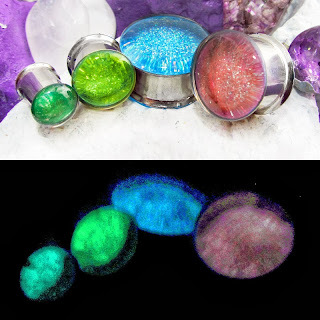 These custom glitter plugs are available in single flared, double flared and screwback 316L surgical steel (titanium coming very soon), and in sizes 6mm to 24mm. Get them before we run out of glowing stuff again!